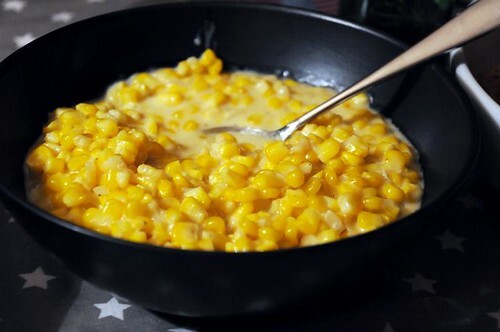 I fell in love with creamed corn during my year as an exchange student in the US. It was of the canned variety, which I had never encountered before. (Nor since - it doesn't exist here.) I've tried making my own a few times before, but I think this was the best attempt yet. If you have a great recipe, by the way - I'd love to try it! I'm thinking about different ways to make this blog more active again - I miss daily updates. One way is to stop writing recipes in Swedish. My Swedish recipe page does have a lot of visits, too, but not nearly as many as this blog, and it does take a lot of time to do both. So, right now, I'm considering not updating in Swedish anymore. What do you think? Would it bother you very much? Fry the onion on medium heat, in half of the butter. The onion should soften, but not color. Add the corn, water and the remaining butter. Cook under a lid for about 10-15 minutes. Add sugar, nutmeg and cream, and cook without a lid for five minutes. Season with salt and pepper. It wouldn't bother me much, but it does happen that I read the Swedish recioe if I'm unsure of something. P.S. Have you ever tried eating your creamed corn on top of mashed potatoes? Yum! I tried this recipe last fall after tiring of eating traditional cream corn during our Thanksgiving holiday. It likely won't fulfill any traditional creamed corn cravings, but it does put a nice twist on the dish. Whenever I make Chinese-style Creamed Corn Chicken Soup, I put a bit more than half of the can of sweet corn in the food processor to break the corn kernels down & get a creamy look. I don't read Swedish so no problem there!